Peterborough Panthers will be after more silverware next season. Peterborough Panthers will race on in 2018. The city club have been confirmed as participants in the SGB Championship – the second tier of the sport – following the British Speedway Promoters’ Association (BSPA) annual meeting over the weekend. Owner Ged Rathbone claimed Panthers’ future was under threat after being hit with a heavy fine by the Speedway Control Bureau (SCB) back in October for allowing Jack Holder to race in Poland. But the Fours and KO Cup double-winners will be back on track in a division swelled to 11 teams by the entry of Lakeside, who raced at National League level last season. The top four teams will again compete in the play-offs, but the possibility of promotion to the SGB Premiership for the title-winners no longer exists. 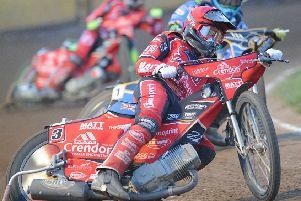 The sport’s bosses have introduced set race-nights for the SGB Premiership (Mondays and Wednesdays) and the SGB Championship (Thursdays, Fridays, Saturdays and Sundays) in a bid to cut out fixture clashes and improve rider availability. The points limit for team building has been increased to 42.5. Tweaks to the rules see the double-points tactical ride rule scrapped. A tactical substitute, where a rider can be replaced a team is six or more points behind, will be used instead. Panthers will begin the defence of their KO Cup crown by facing either Ipswich (the team they beat in last season’s final) or newcomers Lakeside.